At Woodside, we know that not all forms of exercise are created equal, and we understand the importance of cross-training and the benefits that come with it. Cardio is a great way to increase oxygen intake, and strength training notably increases muscle development and overall density; so if you’re looking for a workout that helps you achieve both, then aerobic conditioning is the perfect workout for you. Aerobic conditioning can be achieved through a variety of workouts and class types, but boxing is the omni-workout that has endless benefits for your body and mind. You don’t have to be a professional boxer to look like one. In a weight-class sport you have to fight people who are around the same weight as you, so the goal is to be in the lightest weight class possible. Losing fat makes your healthier and less likely to suffer from things like heart disease, high blood pressure or even joint pain. Of course, not everyone needs to lose fat, but if your doctor tells you that you’re overweight, this total body workout will help you shed unwanted pounds, and build strength and endurance. In the same sense; it’s nearly impossible to box and not lose fat or build muscle. You’re constantly pushing your muscles to their maximum potential through strength and speed drills, creating more muscle mass which can then improve your life by making you stronger and more agile. Not to mention the confidence boost from seeing the development of new muscles on your body. Exercise in general has stress-relieving qualities because it triggers your body to release feel-good hormones such as serotonin and dopamine. Boxing is particularly de-stressing because it allows you to work off pent-up aggression. Some participants claim this type of relief allows them to mentally process their day, week and overall life goals, allowing them to become more alert and feel more focused. This release can lower your blood pressure and make you feel happier. Group fitness classes are a great way to hold each other accountable on personal and community-driven fitness goals, while developing a connection for a class that is not just about physical goals, but mental goals as well. There’s just something about punching bags that brings everyone closer together. 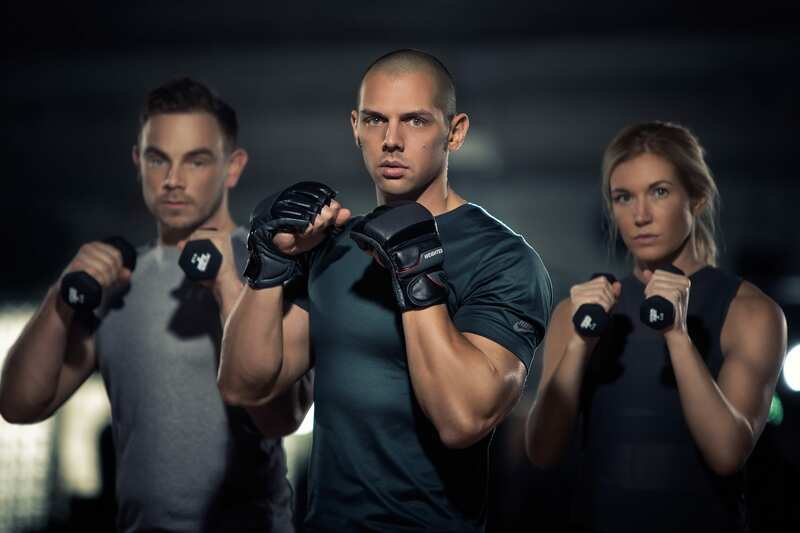 Join the #squad in a boxing bootcamp class, or experience one of Woodside’s other signature aerobic conditioning classes such as Club Cycling®, Strength & Burn and ELITE.